Human lung size is determined by genetics, gender, and height. At maximal capacity, an average lung can hold almost six liters of air, but lungs do not usually operate at maximal capacity. Air in the lungs is measured in terms of lung volumes and lung capacities (Figure 20.12 and Table 20.1). Volume measures the amount of air for one function (such as inhalation or exhalation). Capacity is any two or more volumes (for example, how much can be inhaled from the end of a maximal exhalation). Lung volumes are measured by a technique called spirometry. An important measurement taken during spirometry is the forced expiratory volume (FEV), which measures how much air can be forced out of the lung over a specific period, usually one second (FEV1). In addition, the forced vital capacity (FVC), which is the total amount of air that can be forcibly exhaled, is measured. The ratio of these values ( FEV1/FVC ratio) is used to diagnose lung diseases including asthma, emphysema, and fibrosis. If the FEV1/FVC ratio is high, the lungs are not compliant (meaning they are stiff and unable to bend properly), and the patient most likely has lung fibrosis. Patients exhale most of the lung volume very quickly. Conversely, when the FEV1/FVC ratio is low, there is resistance in the lung that is characteristic of asthma. In this instance, it is hard for the patient to get the air out of his or her lungs, and it takes a long time to reach the maximal exhalation volume. In either case, breathing is difficult and complications arise. P = (Patm) × (percent content in mixture). PCO2= (760 mm Hg) (0.0004) = 0.3 mm Hg. (760 mm Hg − 47 mm Hg) × 0.21 = 150 mm Hg. In the lungs, oxygen diffuses out of the alveoli and into the capillaries surrounding the alveoli. Oxygen (about 98 percent) binds reversibly to the respiratory pigment hemoglobin found in red blood cells (RBCs). RBCs carry oxygen to the tissues where oxygen dissociates from the hemoglobin and diffuses into the cells of the tissues. More specifically, alveolar PO2 is higher in the alveoli (PALVO2 = 100 mm Hg) than blood PO2 (40 mm Hg) in the capillaries. Because this pressure gradient exists, oxygen diffuses down its pressure gradient, moving out of the alveoli and entering the blood of the capillaries where O2 binds to hemoglobin. At the same time, alveolar PCO2 is lower PALVO2 = 40 mm Hg than blood PCO2 = (45 mm Hg). CO2 diffuses down its pressure gradient, moving out of the capillaries and entering the alveoli. Oxygen and carbon dioxide move independently of each other; they diffuse down their own pressure gradients. As blood leaves the lungs through the pulmonary veins, the venous PO2= 100 mm Hg, whereas the venous PCO2 = 40 mm Hg. As blood enters the systemic capillaries, the blood will lose oxygen and gain carbon dioxide because of the pressure difference of the tissues and blood. In systemic capillaries, PO2= 100 mm Hg, but in the tissue cells, PO2= 40 mm Hg. This pressure gradient drives the diffusion of oxygen out of the capillaries and into the tissue cells. At the same time, blood PCO2= 40 mm Hg and systemic tissue PCO2= 45 mm Hg. The pressure gradient drives CO2 out of tissue cells and into the capillaries. The blood returning to the lungs through the pulmonary arteries has a venous PO2= 40 mm Hg and a PCO2= 45 mm Hg. 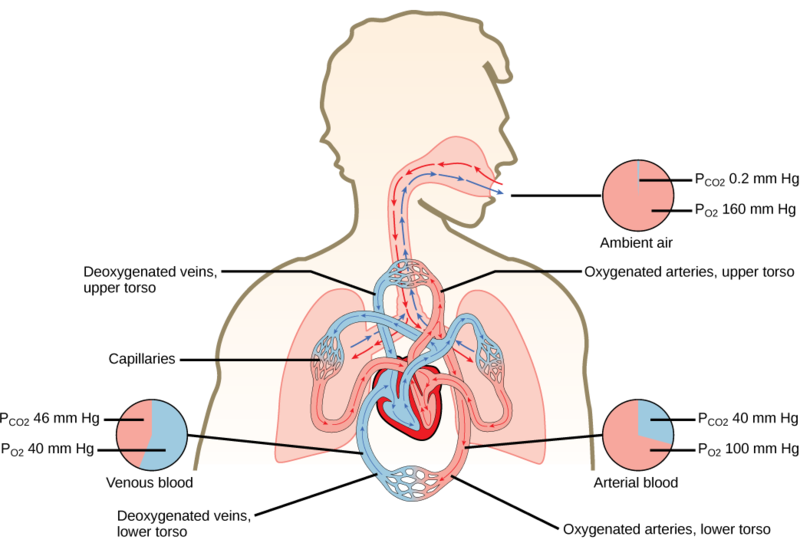 The blood enters the lung capillaries where the process of exchanging gases between the capillaries and alveoli begins again (Figure 20.13). Figure 20.13. The partial pressures of oxygen and carbon dioxide change as blood moves through the body. In the tissues, PO2 drops as blood passes from the arteries to the veins, while PCO2 increases. PO2 is higher in air than in the lungs. A) In the tissues, PO2 drops as blood passes from the arteries to the veins, while PCO2 increases. B) Blood travels from the lungs to the heart to body tissues, then back to the heart, then the lungs. C) Blood travels from the lungs to the heart to body tissues, then back to the lungs, then the heart. D) PO2 is higher in air than in the lungs. 2. The inspiratory reserve volume measures the ________. 3. Of the following, which does not explain why the partial pressure of oxygen is lower in the lung than in the external air? A) Air in the lung is humidified; therefore, water vapor pressure alters the pressure. B) Carbon dioxide mixes with oxygen. C) Oxygen is moved into the blood and is headed to the tissues. D) Lungs exert a pressure on the air to reduce the oxygen pressure. 4. The total lung capacity is calculated using which of the following formulas? 5. What does FEV1/FVC measure? What factors may affect FEV1/FVC? 6. What is the reason for having residual volume in the lung? 7. How can a decrease in the percent of oxygen in the air affect the movement of oxygen in the body? Oxygen moves from the lung to the bloodstream to the tissues according to the pressure gradient. This is measured as the partial pressure of oxygen. If the amount of oxygen drops in the inspired air, there would be reduced partial pressure. This would decrease the driving force that moves the oxygen into the blood and into the tissues. PO2 at high elevations is lower than at sea level because the total atmospheric pressure is less than atmospheric pressure at sea level. 8. If a patient has increased resistance in his or her lungs, how can this detected by a doctor? What does this mean? 20.2 Gas Exchange across Respiratory Surfaces Copyright © by laesoph. All Rights Reserved.